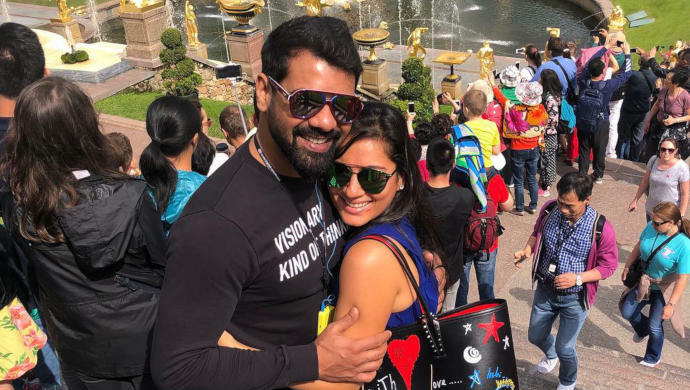 Shabir Ahluwalia aka Rockstar Abhi of Kumkum Bhagya revelled in the wilderness of Bangkok with wife Kanchi Kaul and sons Azai and Ivarr last year. Thailand is the land of tropical beaches, long-standing warm hospitality and ancient ruins. The cultural wealth of this country has been attracting tourists for decades now, which also makes it one of its prime contributors of the nation’s treasury. Cut to Shabir Ahluwalia. Shabir, who plays Rockstar Abhi in the Zee TV show Kumkum Bhagya, took off to Bangkok with wife Kanchi Kaul and two adorable kids. Shabir and Kanchi along with their munchkins Azai and Ivarr made time for a quick trip to Marine Park and Safari World in Bangkok last year. Case in point: Bangkok’s forever bustling leaves no room for rejuvenation. Despite so many weekend getaways galore, one finds it difficult to squeeze in a mini break with fam-jam to escape the urban sprawl of the city. Revelling in the African-like wilderness with an array of species in the open zoo pumps a breath of fresh air like no other vacation perhaps would. There is no greater joy than being in the company of nature! A play date with the ferocious one, anybody? Shabir’s better half had even shared pictures of some of the cuisines the couple pleased their palates with during their tour. Still wondering where to take your kids the next time they ask for a holiday? Book your tickets to Safari World right away! And yes, you can never get enough of the marvels of nature. Because there indeed is such things as too good. Besides, kids love animals and a little GK didn’t hurt anybody? Share your experiences at Marine Park and Safari World in the comments box below. Stay tuned for exciting updates about Shabir Ahluwalia!